Money comes and money goes, but economies keep on moving forward. There are certainly hundreds, maybe thousands, of currencies that were once the backbone of commerce and trade in their day that are no longer in use. 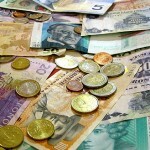 This list presents ten currencies that have recently gone out of circulation. 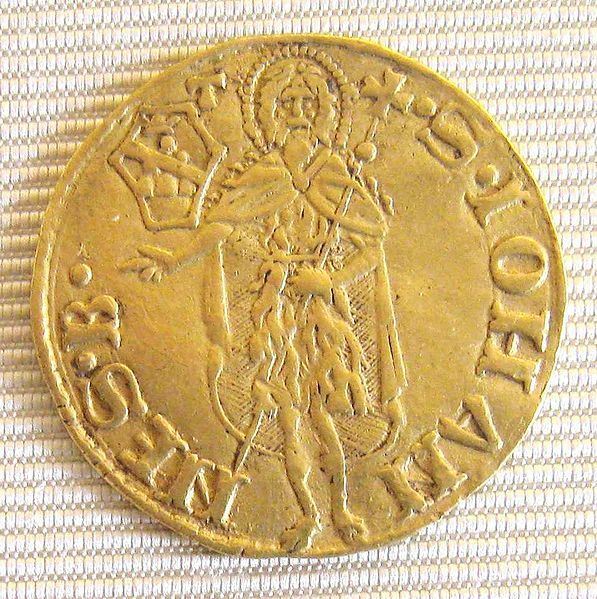 The first florin was the Italian one struck in gold in 1253 in Florence from which the name is derived. This was the first gold coin minted in significant quantities in Western Europe since the 7th century. 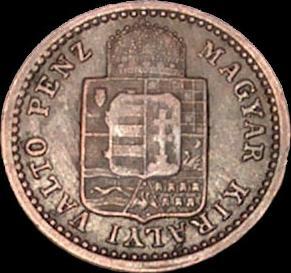 The Italian coin was very popular and quickly imitated in Europe and throughout the colonies of European countries. It had 54 grains of gold (3.5g, 0.1125 troy ounce). The “fiorino d’oro” of the Republic of Florence was the first European gold coin struck in sufficient quantities to play a significant commercial role since the seventh century. As many Florentine banks were international supercompanies with branches across Europe, the florin quickly became the dominant trade coin of Western Europe for large scale transactions, replacing silver bars. 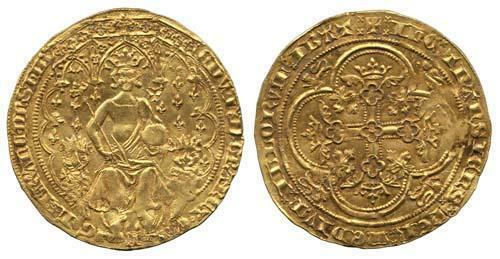 This was a rare old gold coin valued at six shillings, used only in 1344. In 1344, Edward III of England issued his own gold coin valued at six shillings and having a weight of 108 grains. This coin was also called a florin and also a double leopard from the two leopard heads that are on either side of the seated figure of the king on the obverse. With the exception of a rare gold penny (worth 20 silver pennies) minted in 1257 under Henry III, the coins of Edward III were the first gold ones in England in about 350 years. Unlike the Italian florin, Edward’s florin was not very popular and was soon superceded by the noble. Thus it was not until 1849 that another coin was issued in England or Great Britain bearing the name florin; this time in silver. The discovery of silver mines in the mid-fifteenth century led to the issue of the taler which was initially equal in value to a gold gulden. Frederick III of Saxony began the production of talers in Germany in 1500. These large silver coins enabled Germany princes, bishops and others to put their portraits on the coins or commemorate important events. The spread of mechanized coin production in the sixteenth and seventeenth centuries further strengthened the importance of the Taler in Germany. 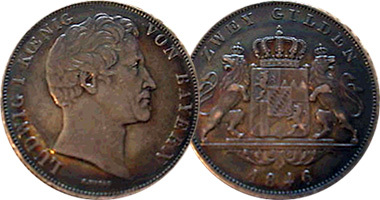 The Gulden was the currency of the states of southern Germany between 1754 and 1873. These states included Bavaria, Baden, W�rttemberg, Frankfurt and Hohenzollern. There were basically three monetary systems in Germany, one for the Northern states, one for the Southern states, and a separate system for Hamburg and Luebeck. These three systems were consolidated in 1871 when the Mark replaced the Thaler, Gulden, and Schilling. The first coins in Hungary were issued in the third and second centuries BC by local Celtic tribes. The Roman province of Pannonia was located in present-day Hungary and coinage used to pay Roman troops there on the frontier circulated during the Roman Empire. Austria began issuing banknotes through the Banco-Zettel after the Convention of Vienna in 1753. The banknotes fluctuated in value throughout the 18th and 19th centuries. 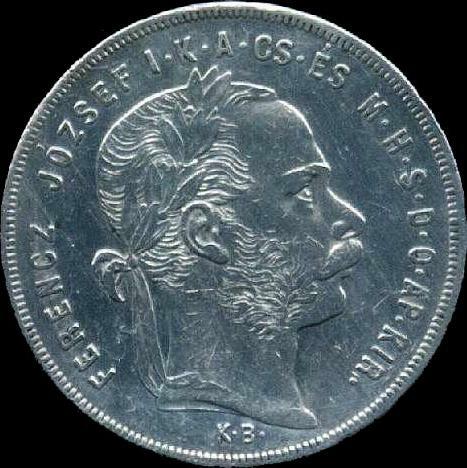 The paper Gulden fluctuated in value relative to specie money as Austria-Hungary made repeated attempts to stabilize its currency in the 1800s.The Gulden or forint or was the currency of the Austro-Hungarian Empire between 1754 and 1892 when it was replaced by the Krone/korona as part of the introduction of the gold standard. The florin was the currency of the British Colonies and protectorates of East Africa from 1920-1921, and was specifically introduced as a regional currency. 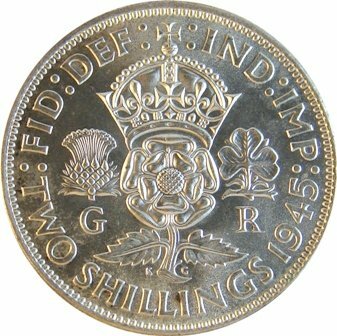 At first the currency was to have been called the East African rupee, but before it was actually issued the British government decided, at the request of British settlers, to change the name to the florin (the name of the British coin worth two shillings, or one-tenth of a pound sterling). The coins of this currency are particularly rare. Because of its short period in existence, few of the coins minted were actually issued and are consequently scarce today. Coins were minted in denominations of 1, 5, 10, 25 and 50 cents and 1 florin but, according to the “Standard Catalog of World Coins” C. L. Krause & C. Mishler, Krause Publications, the 50 cents coins were not released for circulation and only 30% of the 1, 5 and 10 cents coins produced were issued for circulation. 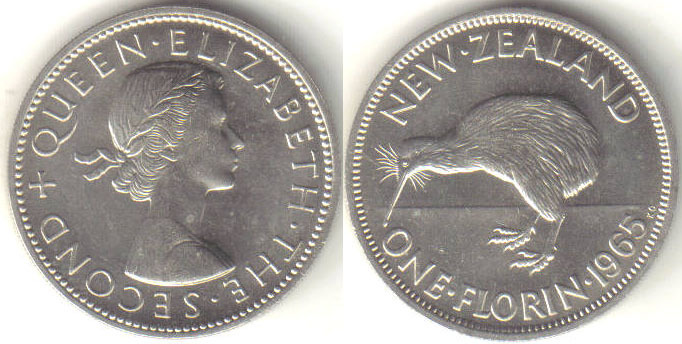 The Coinage Act, 1933 governed the currency, coinage and legal tender in New Zealand, and meant that British coin ceased to be legal tender as at 1st February 1935. New Zealand then became the last and most remote of the self-governing dominions of the British Commonwealth to introduce its own coinage. 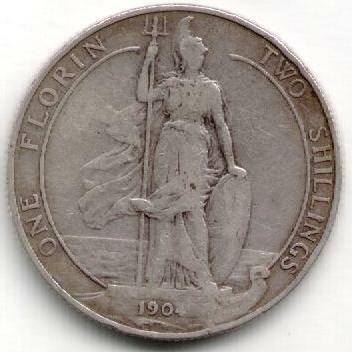 The florin coin (more commonly known as the two-shilling coin) was a pre-decimal coin and worth 1/10 of an Irish pound. 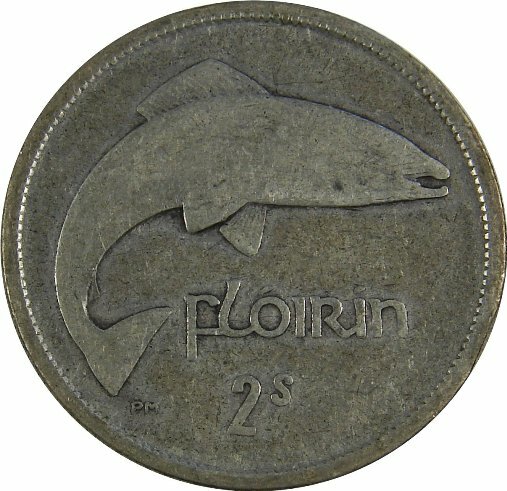 The Irish Florin was produced from 1928 to 1968, made with silver to 1943 and copper/nickel after that. The main obverse design features the Irish Harp separating the date. 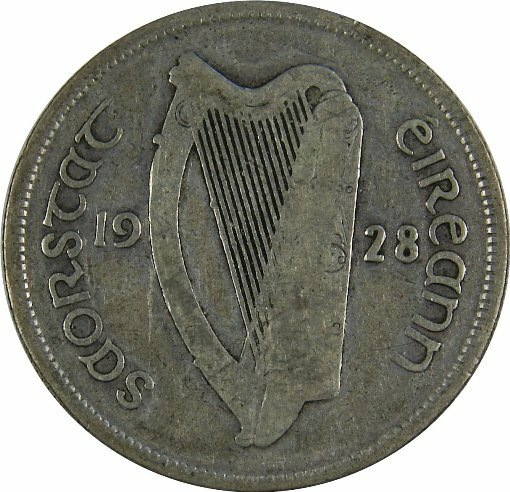 From 1928 to 1937 the obverse featured the legend �SAORSTAT EIREANN� or Irish Free State. This legend would later be shortened to just �EIRE� or Ireland beginning in 1939. In 1847 a proposal was put forward for decimalisation of the pound, with the introduction of coins worth a tenth and a hundredth of a pound. As a consequence a tenth of a pound coin was introduced to test public opinion.� The first florins were struck in 1849 as silver coins weighing 11.3 grams. These first coins would have come as rather a shock to the public, as for the first time in nearly 200 years a British coin featured a portrait of the monarch wearing a crown. Even more of a shock, including, allegedly, to Queen Victoria herself, was the omission of “DG � Dei Gratia”, by the grace of God � from the coin’s inscription, which resulted in it being popularly known as the Godless Florin. The coin had its denomination inscribed variously one florin, two shillings, or with both denominations. Although Canada, like its American cousin, had long had a “silver” dollar, the dollar hadn’t seen much use as a circulated coin in the latter part of the 20th century; citizens of both countries greatly preferred their respective homelands’ one-dollar banknotes. One-dollar bills, however, are now impractical when viewed from a cost-benefit basis: they wear out, necessitating replacement far more frequently than dollar coins would. Paper currency has a life expectancy of nine months, whereas coins are good for twenty years. 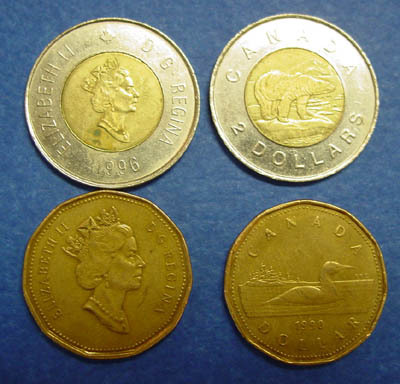 With the introduction of the loonie ($1 coin) and the toonie ($2 coin) in 1989 and 1996, respectively, paper bills for the $1/2 denominations were taken out of circulation. The $1 note remained in issue and in circulation along with the coin for the next two years, until the note was finally withdrawn on June 30, 1989. The Dutch guilder was the currency of the Netherlands from the 17th century until 2002, when it was replaced by the euro. The Dutch name gulden was a Middle Dutch adjective meaning “golden”, since the coin was originally made of gold. 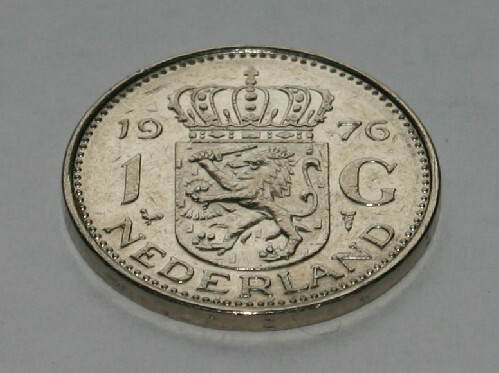 In the Netherlands, both silver and gold guilder coins were issued. In 1581, the silver guilder was established as the currency of the United Netherlands by the Estates-General. one more currency no longer in circulation — anything that I make, after the divorce stole it all!